They're already barrel-aging your booze, so it was only a matter of time before they got to your rooster sauce. But they need your help! An enterprising sauce maverick on Kickstarter is now seeking donations for Barrel-Aged Sriracha, which is essential to any Sriracha swag collection. Lisa Murphy's Sosu Sauces isn't affiliated with reigning Sriracha champ Huy Fong Foods, but it has built a reputation for its gourmet hot sauces, ketchups, and -- wait for it -- "Srirachup". 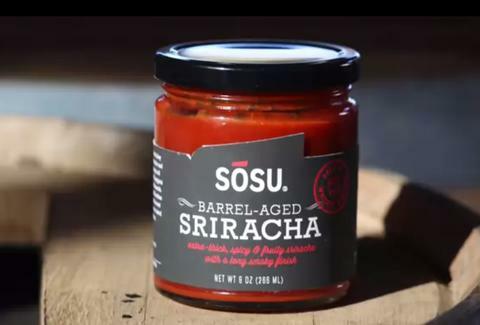 Now, via Kickstarter, Sosu is offering a special Sriracha that spends 3mos in an oak barrel Jacuzzi -- only one month less than JWoww in Miami -- to ensure optimum smokiness and flavor. Help them out before March 8th and you could be the proud owner of not just the sauce, but some Sriracha salt and a kickass tote bag. And who doesn't love a new tote?! You know what to do.